I often dream about chopping my hair and radically transforming my look. But I know from terrible past mistakes that I will never look good with my hair really short. The joys of having really long hair is that there's so many different ways to style it! Here are some clever and easy ways to style your own hair. You could definitely style your own for your engagement party, rehearsal dinner or bridal shower! Listen to your stylist when she tells you NOT to wash your hair the morning of your wedding day. The slight grease in your hair helps keep the style SO much more! Okay, well with this one, I can never seem to tease my hair enough to get a nice bump in the back. But I have seem to have mastered this one. When all else fails, tease your hair A LOT and use lots of hair spray! I have yet to try this one, but isn't it gorgeous? 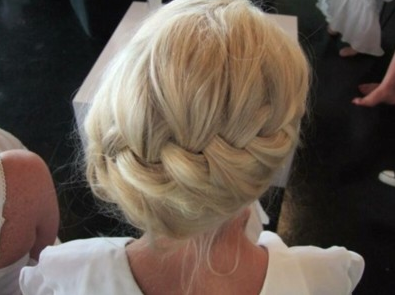 It's like a sideways braid but I'm sure it's way more complicated than that! Phew, day 4 done. Okay, I'm not going to lie, it's really keeping me accountable because I said that I'd post on the blog every day in May!